The Philippine Statistics Authority (PSA) recently reported that the national inflation rate has slowed down to 3.1 percent for the month of May after it reached a high of 3.4 percent for the months of April and March of this year. Although inflation has eased last month, the rate is still comparatively high in the same month last year where inflation was only registered at 1.6 percent. Last year, the average inflation rate was only 1.92 percent but this year, the average inflation so far is already at 3.2 percent. As the momentum for further increase in general prices of goods and services in the economy grows, market insiders are already projecting a higher inflation average of 3.5 percent by year-end. Rising inflation is seen as undesirable in general because higher prices can hurt fixed income people like those who live on salary, retirees and small savers because their ability to purchase is being diminished by the increase in prices of goods and services. Inflation can also cause interest rates to go up, which may hurt companies that have long-term loans with financial institutions as well as people with housing and business loans. While these are possible scenarios under an environment of rising prices of goods and services, a manageable increase in inflation may not be necessarily bad. In fact, inflation is good for the growth of the economy. The recent rise in inflation to 3 percent can be a good sign of an active economy. It can be an attractive business indicator that people are spending. When people spend, businesses expand. When there is inflation, it is a signal that people are spending. It indicates that there is a large amount of money that is circulating in the economy. The more money that circulates, the more the economy grows because people spend and consume more. A growing economy with the prospect of rising consumption provides huge opportunities for business expansion. This can also be a good time for you to try on new business ideas to take advantage of the economic growth. Expansion from businesses will also result to an increase in employment opportunities. Inflation tends to lower your purchasing power when your monthly income is fixed. When general prices increase, your ability to buy the same amount of goods and services diminishes if your income does not increase proportionately. Because of inflation and the expectations of rising prices, companies adjust salaries of employees annually by a percentage higher than the historical inflation rate. Employees also tend to be more productive realizing the need to afford the higher cost of living by working extra hours by overtime or doing other sidelines, hence increasing productivity. One of the functions of the Central Bank is to manage the money supply in the economy by adopting qualitative and quantitative measures to provide stability in general prices. When inflation is rising, it signals that aggregate demand for goods and services is also increasing. What the Central Bank would normally do is to increase interest rates to encourage consumers to save their money rather than spend. As savings increase, the supply of money in circulation decreases, slowing down aggregate demand in the economy. This is how the Central Bank keeps inflation in check at all times. Rising interest rate as a result of higher inflation is welcome news for those who save money. You get more interest income for your hard-earned savings. Keeping your money in the bank to earn higher interest may not be enough. 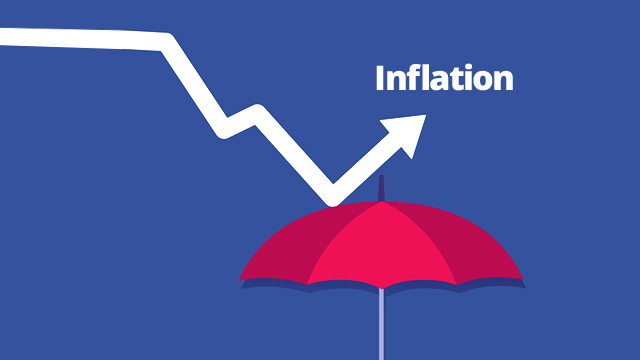 If inflation is higher than the interest rate your bank promises you to pay, the net inflation effect may still cut down the value of your savings. For example, if the interest rate is two percent per annum but inflation is 3.4 percent, the real interest rate you are actually earning is negative 1.4 percent. So for as long as the real interest rate remains negative, you must find other opportunities to invest where you can earn a real positive return on your investment. For example, you can invest more on stocks where the returns may be higher. Or you can also invest in real estate for rentals where the annual yields are higher. Investing in stocks can be a good hedge against inflation over the long term. Stocks are one of the few assets that you can rely on when it comes to beating inflation. The other asset that you can consider is real estate, which tracks inflation through value appreciation. Stocks can beat inflation over time because companies can raise prices to account for rising costs brought about by inflation. For example, when cost of sales and wages increases due to inflation, companies can simply pass on the higher cost to consumers by raising prices over time. When companies increase their prices, their revenues and earnings also increase. The higher the earnings, the higher the valuation, which leads to higher share prices.